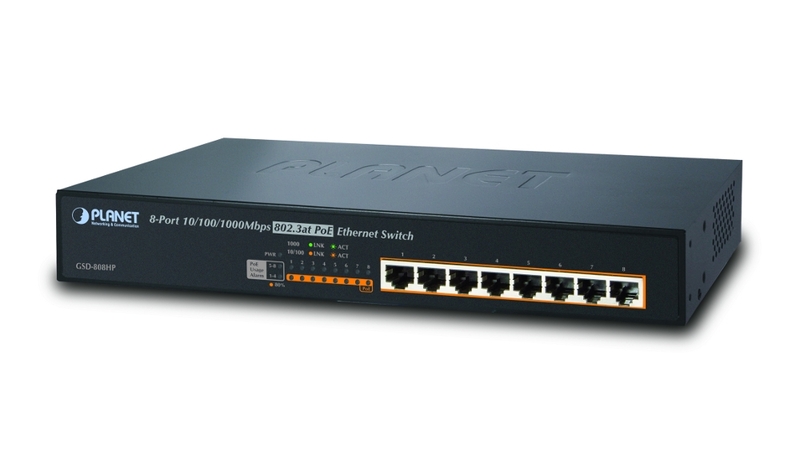 The PLANET GSD-808HP is 8-Port 10/100/1000Mbps (high power) PoE network switch, ideal to fulfil the demand of High Power PoE for network applications with Fast Ethernet speed transmission. Each 10/100/1000Mbps port of GSD-808HP features IEEE 802.3af and High Power IEEE 802.3at Power over Ethernet (PoE) that combines up to 130 Watts power output and data per port over one Cat.5E / 6 Ethernet cable, with a total of 130 Watts PoE budget on whole system. This product comes with a 3 year manufacturer's warranty.